Before I tried my hand at making samosa, a pyramid-shape fried pastry, I thought I was pretty familiar to it... used to enjoy it at my favorite Indian restaurant in Hongkong; often munched it between errands in Singapore; and also phoned for delivery whenever I had a craving (as the slogan said on their menu: you curry I hurry) ... but my very first batch of samosas looked more like fortune cookies or wantons though, could I blame it on my inherited trait :P ? In such case, might as well turn something more fun - Mickey mouse! It's done by my mini moon cake's mould. The recipe is found at Monisha's blog Coconut Chutney, she made such comforting and satisfying (so is her writing!) potato samosas, they're delicious to taste and easy to make; I made one more batch another day that looked much closer to the original shape :D Monshia's recipe is versatile and easy to follow. My filling is done pretty much the same as what she did: cooked the diced potatoes with hot green chilly, shallot, tumeric, cumin, red chilly pepper, then mashed. For the crust I used durum whole wheat flour (chappati flour) instead: 1 cup chappati flour + 2 tbps of very cold butter + pinch of salt + 1/4 baking powder + iced water. First, mix the flour with salt and baking powder, add in cold butter, use a fork or pastry blender to cut it further until the mass resembles to coarse cornmeal's texture. Add ice water, only spoonfuls at a time, mix, you're not looking for wet dough, it just comes together then you should stop adding water. Press it into a flat disk, wrap, rest in the fridge for an hour. Roll the dough to 1/8 inch-thick, you should rest the dough again whenever you feel it refuse to spread, cover and chill if necessary. Cut out a small piece of flatten dough, spoon in the filling, seal. Push it into your mould (e.g. mini-moon cake mould, the pastry is about a size of big walnut; or candy mould; or mini cake mould, etc). Deep fry over medium/medium-high heat until golden brown. These are so cute. Your creations are just getting better anf better every post! hehehe those are too cute, Gattina! Thank goodness I never knew these exsisted when I was a kid, my poor mom would have been making them all the time. They are so cute, I really like it!! that has to be the cutest samosas ever. where can i get hold of one of those molds? This is so much fun! Cute cute! Perhaps we should call it "Micymosa". Cute and creative !!!! Beautiful. I really should practise more! 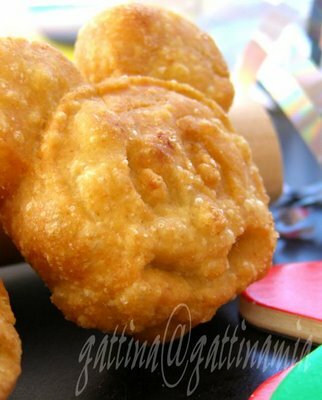 such a beautiful Mickey!can I have one? jenjen, oh thanks! I don't know if I should call it creations... when I was desperated (making that triangle shape but just couldn't! ), something else would come up. Shaheen, I got mine in Hongkong. But I know this mould very common, if you have a chance going to China Town, check their bakeware supplies stores, although I'm not sure if they carry a varitey of cartoon characters' designs. Oh one thing to note, the filling should be paste form (like this one is mashed potatoes), so the imprint should come out very clear, and it won't break the crust. Bea, thanks! After I made them, I also giggled. Angie, yes lor, the other days we just talked about my abandoned mickey mould, now he's here. Archana, ohhhhh I love the name!!! You're so clever! Can I use this name? Really so cute! Btw, I miss your cakes these days! Saffron, oh thanks! I'm happy to trade one Micymosa (Archana, see what you did :D) with your scrumptious lasagna! I'm so glad you tried out the recipe.. yaaay! 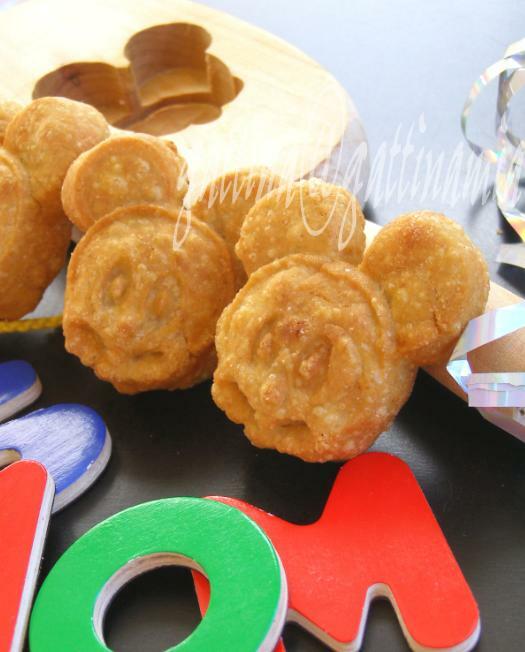 The mickey molds looks so cute, I'll have to watch out for those, who doesn't love disney characters especially if they are edible !! Also, Thank you for your kinds words, you're way too sweet :)!! Monisha, your recipe is a keeper! They're adorable. You're so clever! I love samosas, but I've never seen any that looked this cute! I might pause a little before I gobbled Mickey down--but not too long. thanks gattina, chinatown here i come.